Muhammad Ali was born Cassius Marcellus Clay Jr. on January 17, 1942, in Louisville, Kentucky, the first of Cassius Marcellus Clay Sr. and Odessa Grady Clay's two sons. His father was a sign painter who also loved to act, sing, and dance; his mother worked as a cleaning lady when money was tight. Ali began boxing at the age of twelve. His bicycle had been stolen, and he reported the theft to a policeman named Joe Martin, who gave boxing lessons in a local youth center. Martin invited Ali to try boxing and soon saw that he had talent. Martin began to feature Ali on his local television show, "Tomorrow's Champions," and he started Ali working out at Louisville's Columbia Gym. An African American trainer named Fred Stoner taught Ali the science of boxing. Among the many things Ali learned was how to move with the grace and ease of a dancer. Although his schoolwork suffered, Ali devoted all of his time to boxing and improved steadily. As a teenager Ali won both the national Amateur Athletic Union (AAU) and Golden Gloves championships. At the age of eighteen he competed in the 1960 Olympic games held in Rome, Italy, winning the gold medal in the lightheavyweight division. This led to a contract with a group of millionaires called the Louisville Sponsors Group. It was the biggest contract ever signed by a professional boxer. Ali worked his way through a series of professional victories, using a style that combined speed with great punching power. He was described by one of his handlers as having the ability to "float like a butterfly, and sting like a bee." Ali's unique style of boasting, rhyming, and expressing confidence brought him considerable media attention as he moved toward a chance to fight for the world heavyweight boxing championship. When he began to write poems predicting his victories in different fights he became known as "The Louisville Lip." Both the attention and his skill as a fighter paid off. In February 1964, when he was only twenty-two years old, he fought and defeated Sonny Liston for the heavyweight championship of the world. Inspired by Muslim spokesman Malcolm X (1925–1965), Ali began to follow the Black Muslim faith (a group that supports a separate black nation) and announced that he had changed his name to Cassius X. This was at a time when the struggle for civil rights was at a peak and the Muslims had emerged as a controversial (causing disputes) but important force in the African American community. 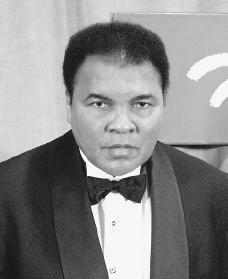 Later the Muslim leader Elijah Muhammad (1897–1975) gave him the name Muhammad Ali, which means "beloved of Allah." (Allah is the god worshipped by Muslims.) In his first title defense in May 1965 Ali defeated Sonny Liston with a first-round knockout. (Many called it a phantom punch because it was so fast and powerful that few watching the fight even saw it.) Ali successfully defended his title eight more times. In April 1967 Ali was drafted into military service during the Vietnam War (1957–75; a war fought in an unsuccessful attempt to stop Communist North Vietnam from overtaking South Vietnam). He claimed that as a minister of the Black Muslim religion he was not obligated to serve. The press criticized him as unpatriotic, and the New York State Athletic Commission and World Boxing Association suspended his boxing license and stripped him of his heavyweight title. Ali told Sports Illustrated, "I'm giving up my title, my wealth, maybe my future. Many great men have been tested for their religious beliefs. If I pass this test, I'll come out stronger than ever." Ali was finally sentenced to five years in prison but was released on appeal, and his conviction was thrown out three years later by the U.S. Supreme Court. Ali returned to the ring and beat Jerry Quarry in 1970. Five months later he lost to Joe Frazier (1944–), who had replaced him as heavyweight champion when his title had been stripped. Ali regained the championship for the first time when he defeated George Foreman (1949–), who had beaten Frazier for the title, in a fight held in Zaire in 1974. Ali referred to this match as the "Rumble in the Jungle." Ali fought Frazier several more times, including a fight in 1974 staged in New York City and a bout held in the Philippines in 1975, which Ali called the "Thrilla in Manila." Ali won both matches to regain his title as the world heavyweight champion. In 1975 Sports Illustrated magazine named Ali its "Sportsman of the Year." Ali now used a new style of boxing, one that he called his "rope-a-dope." He would let his opponents wear themselves down while he rested, often against the ropes; he would then be strong and lash out in the later rounds. Ali successfully defended his title ten more times. He held the championship until Leon Spinks defeated him in February 1978 in Las Vegas, Nevada. Seven months later Ali regained the heavyweight title by defeating Spinks in New Orleans, Louisiana, becoming the first boxer in history to win the heavyweight championship three times. At the end of his boxing career he was slowed by a condition related to Parkinson's disease (a disease of the nervous system that results in shaking and weakness of the muscles). Ali's last fight (there were sixty-one in all) took place in 1981. As Ali's boxing career ended, he became involved in social causes and politics. He campaigned for Jimmy Carter (1924–) and other Democratic political candidates and took part in the promotion of a variety of political causes addressing poverty and the needs of children. He even tried to win the release of four kidnapped Americans in Lebanon in 1985. As a result, his image changed and he became respected as a statesman. At the 1996 Summer Olympic Games in Atlanta, Georgia, the world and his country honored Ali by choosing him to light the Olympic torch during the opening ceremonies. Ali remains in the public eye even as he continues to suffer from the effects of Parkinson's disease. In 1998 he announced he was leaving an experimental treatment program in Boca Raton, Florida, claiming that the program's leader was unfairly using his name to gain publicity. In 1999 Ali became the first boxer to ever appear on a Wheaties cereal box. Later that year he supported a new law to clean up the business side of boxing. After the terrorist attacks on the United States on September 11, 2001, Ali agreed to record sixty-second announcements for airing in Muslim countries to show that the United States remained friendly to those of the Muslim faith. Among many documentaries and books about Ali, a film version of his life, Ali, was released in December 2001. Myers, Walter Dean. The Greatest: Muhammad Ali. New York: Scholastic Press, 2001.